New Kelsoft weighing Software is easy to use and offers the user the ability to newdownload data automatically from our Scaime indicators and also from the most popular indicators in the Australian market. KELSOFT is a basic and low cost solution to realtime Data collection from weighing equipment and can be used in, “inventory weighing” , “and any industrial application” where an item needs to be identified, weighed, recorded and totaled for use in managerial or accounting areas and transfer of information to a database. Barcode scanner or any electronic device that is compatible with PC, can be used for this software. Scanned items are weighed and automatically recorded for collection into the database where totals(individual or Batch), Average, Time and Date can be collected or shown in Graph form. The data can be printed or transfered to Excel. 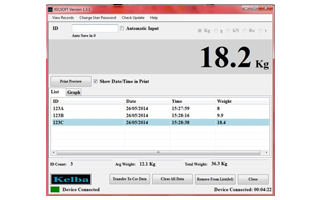 If you require a basic inexpensive software interface to your weighing equipment, give KELBA a call and see if “Kelsoft” is the answer for your needs.